To ask Chris Grabenstein questions, please sign up. what will the next books in the series be called? Chris Grabenstein Hi. The next book in the Mr. Lemoncello series will be called MR. LEMONCELLO'S LIBRARY OLYMPICS! Chris Grabenstein Read, read, read. Write, write, write. Every day. Caroline that is what my school librarian (love her) told me when I asked he this question. She (Linda Bethers) wrote christmas oranges. Juliet I already do this all the time!
" 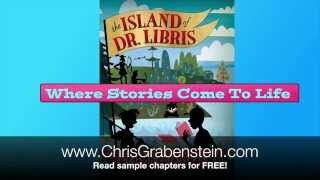 The Island of Dr. Libris "
We’d love your help. Let us know what’s wrong with this preview of The Watsons Go to Birmingham - 1963 by Christopher Paul Curtis. Now that we have a Mock Newbery medal we can pick an honor book. Which book would you choose to receive an honor award for our Mock Newbery? Hi Chris. Lovely to catch up with you here. Thanks so much for Friending me. How's the writing going with you? You've got quite the buzz at DorothyL - thanks for adding this new author to your list of friends. Hi! Thank you so much for being a fantastic fan! The big news here is my YA book, THE CROSSROADS, was just nominated for an Agatha Award. Thanks again for reading and writing! Hi Chris! I'm feelig pretty honored to be added to your friend list! Just couldn't resist being a fan. Andrea M. Kulman wrote: "Hi & thank you for being a friend. Have a very Merry Christmas & a Happy New Year! P.S. Trojan Man was the best advertisement ever!!! Even my kids know "Trojan Man", hehehe..."
Hi! How funny that you remember TM! Secretly, when we were recording, we named his horse Magnum...after a special brand of condom Trojan had just introduced!